There is a small metal bowl that sits on my dresser. 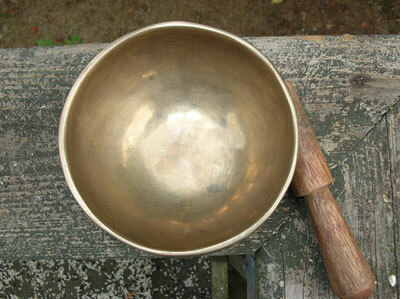 A Tibetan singing bowl, accompanied by a wooden striker called a puja. 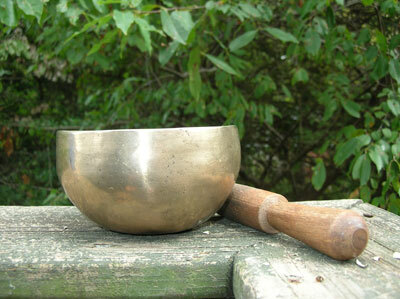 A bowl such as this is used by monks as a meditation aid, its sound meant to start or end silent reverence. The craftsman who hammered this cylinder blessed it before he or she sent it off into the world, intending for its music and pounded prayer to be passed on to whoever owns the bowl. It is played by holding it in the flat open palm of one hand, allowing the body of the bowl to vibrate freely while running the wooden striker around the outside rim with the other hand. The bowl can also be struck on its side to summon its sound. Each bowl is made to represent one note. It is also said that the bowl's sound represents one human emotion. What I like so much about this bowl is that it is imperfect, not made by machine. It is small, and wobbles slightly when placed on a flat surface. But when held in this human hand, its imperfection still creates a sound that's true. It is humbling to hold. Sound travels, and art is passed to new life. My brother-in-law David Mankin is a classical musician. English horn and oboe. The first time I heard Dave play was many years ago, in a small dark church in Springfield, Virginia. He and my sister Kathy had just started dating, and Dave's solo that evening was Bach. Jesu, Joy of Man's Desire. He played. I cried. For those of you who don't know me, I am not a weeper in public. That night I was face-to-face with the stark beauty of art played, not for vast fortune, but for the pure love of creation. By someone who just loves to make music. That is the musician Dave is. My sister married this art, and he gives rise to his soul through every note. Today he shared with me another gift. His brother Phil had bought Dave a birthday present: a DVD set called Leonard Bernstein's Young People's Concerts with the New York Philharmonic Orchestra, televised programs that introduced an entire generation to the joys of classical music. Dave wished to show me his teacher, Englebert Brenner, who performed solos during these, and many other concerts. "Englebert Brenner was an oboist and English horn player in the New York Philharmonic for 42 years - from Toscanini to Boulez. He moved to New York City from Vienna, Austria in 1908, and attended the High School for the Performing Arts. He played saxophone with the Keats Boy's Band, where he was handed an oboe to try. He played on ocean liners and show orchestras, even performing for the grand opening of New York's famed Roxy Theater. Brenner returned to Vienna to study oboe. His parents, sensing the direction of the political climate of the German/Austrian governments, called Engelbert back to the States, claiming his mother was on her death bed. It was, in fact, a trick to get him back home. Brenner was half-Jewish, and would have perhaps not 'weathered the storm' in Europe. His mother was apparently on the pier, waving enthusiastically to welcome her son back to NYC safely. 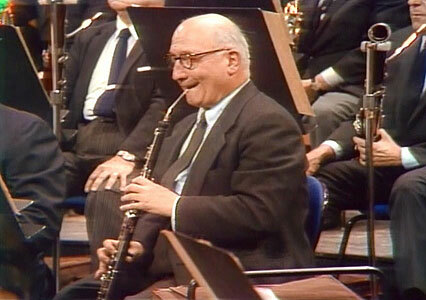 'Bert' Brenner won a position as 2nd oboe in the Cleveland Orchestra in 1928. He was then asked to play English horn in the Franck Symphony, as the conductor was dissatisfied with the way the orchestra's regular English horn player played the 2nd movement's solo passages. The position of English hornist was then his. The 1st sounds in performance ever heard in Cleveland's Severance Hall were Brenner's English horn, playing a piece commissioned for the hall's grand opening by Griffis. English horn alone begins the work. While on tour in New York, the Cleveland Orchestra performed both the Franck and La Mer on the same concert. Someone heard Brenner's playing, found him backstage, and suggested he take a train down to Philadelphia the next day. Maestro Toscanini would be interested in hearing him play. Brenner played for Toscanini in a hotel room, and was offered a contract with the New York Philharmonic." Today Dave advanced one of the DVDs to show Leonard Bernstein talking about La Symphonie Fantastique by Berlioz. An English horn solo was introduced. It was Mr. Brenner. The same sound, same arch of the back reaching up high, same note of truth, same love of creation. The day Dave married my sister, he wore Mr. Brenner's suit. And Mr. Brenner's English horn, the one seen on the DVD, is alive and nurtured in Dave's music room to this day, playing the same prayer. For those of us who teach, or who create art in words or sound or with paint or hammer, it is a lesson to know our efforts are embraced. That one action begets another, and that meaning can be taught and passed down and held safe by the few with flat open palms. This is yachi. I live in NY and come from Taiwan. I am writing a statement of purpose for applying a graduate program. My project is related to the sound of metal bowl. Would you mind I use the first picture (a bowl with a striker) in my paper? My mother was also a student of Bert Brenner's and was so moved by your story, that she would like to chat with david about Bert. This would be wonderful. you can reach her, laura Nemeyer at adoptara@aol.com.